Rachel Poliquin's Breathless Zoo is the second great book about taxidermy that I've read in recent years, following Dave Madden's Authentic Animal. I'm not going to choose up. They're very different books, and though they cover some of the same territory, they take complementary perspectives. I loved both and I want to read others that extend their insights further. Poliquin takes a less personal (but not entirely invisible) approach than Madden. She's also more schematic: where Madden veers between an impersonal analysis of taxidermist Carl Akeley and some wacky travelogue, Poliquin sets out to examine seven different themes in the historical practice of the art, connecting each theme to an era and/or genre of taxidermy. The Breathless Zoo starts in somewhat familiar territory, at least territory fairly well covered by historicist cultural critics in recent decades (and Poliquin is exemplary about citing their work). She starts with the cabinets of curiosities that became a fascination of 17th- and 18th-century imperial Europe. In those early-modern days, preservation techniques were helpless against decay, so it tended to be the durable parts of animals that could be collected, for very long, at least. It may seem quaint to us to assemble shells, antlers, and talons, but it was a practical way for early collectors to show off the unusual. "Wonder" is Poliquin's theme here, a drive to collect the most amazing scraps of the animal world. The second section of The Breathless Zoo is about "Beauty," and Poliquin says that she will talk about the 19th-century mania for mounting and arranging hummingbirds. Their size, showiness, and forgiving contours made birds favorites of early-Victorian taxidermists. Poliquin isn't afraid to repeat herself, or to return to and re-emphasize points (her favorite being that taxidermied animals are both presence and absence, liminal between creature and object, hence polyvalent and uncanny). "Beauty" may be her weakest chapter, or perhaps just the weakest stretch of the book, as experienced in the order or reading. In "Spectacle," the book begins to gather original momentum and increasingly to meld fascinating specifics with fascinating theoretical analysis. Perhaps that's because here, in the mid-19th century, Poliquin begins to elucidate "modern" taxidermy techniques, based on forestalling decay via the use of arsenic compounds, and mounting skins on pre-sculpted manikins that allowed a taxidermist to combine preservation and presentation. For the first time, animals could not only be stuffed, not only be sweetly quiescent, but could be posed dynamically. 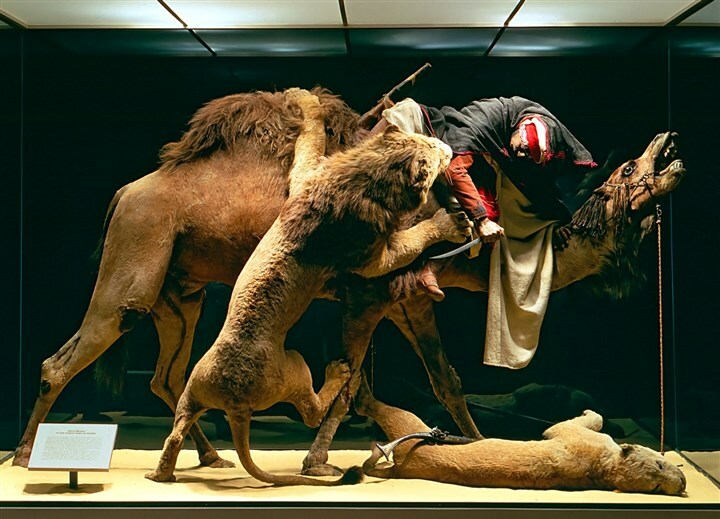 Jules Verraux, in 1867, went beyond dynamic to create one of the most bloodcurdling arrangements ever, Arab Courier Attacked by Lions. This macabre piece looked very familiar to me, and I realized why: I saw it last year in the Carnegie Museum in Pittsburgh. At the time I thought it was tacky and ill-advised, and I walked off after a short examination. It is tacky and ill-advised, but the Carnegie keeps it on display in a virtually ironic kind of way, more as an exhibit about French tastes in the 19th century than as any kind of informational depiction of lions, camels, or Arab couriers. "Spectacle" vied with "Order," Poliquin's next rubric, in Victorian museums. Apparently Charles Darwin, appalled that the general public could just go in and mill around working scientists, advocated for the now-standard separation of natural-history collections into display mounts vs. study skins neatly packed in drawers. As Poliquin notes, there is nothing spookier, nothing that so quite exemplifies her subtitle theme of "longing," than taxidermy of extinct species. The scores of specimens of squirrels and pigeons seem superfluous, even stupid, when displayed as study skins, and you wonder what the museum is even there for. Then you realize that the place really is an ark of sorts. The Breathless Zoo proceeds through "Narrative" (hunting trophies) and "Allegory" (comic novelty taxidermy scenes, postmodern artistic appropriations) to "Remembrance" (taxidermied pets). The topics get weirder, the prose gets more insistent, and the impact gets deeper, more indelible. There are scientific rationales for museum displays, after all, however complicated they are by desire; in the display of trophies and gags and souvenirs there are no rational concerns to get between our unconscious and the preserved animal. Poliquin writes perceptively about hunting trophies, which preserve (or should) a specific animal of personal importance to a hunter, one that always comes with a story attached. In my experience of hunting stories, few match her adducing of the noble-elk yarns of Austrian collector William Adolph Baillie-Grohman. This dapper great white hunter of the 1880s brought his moose heads and his stories back to the Tyrol and bedecked his home with them. Poliquin mentions that the house is now a bed-and-breakfast. I get the sense she stayed there, but this is not an "interview-driven" book; she's a personal observer in it, sparingly, but travelogue is not the point, nor is the current charming owner of the B&B. Baillie-Grohman is the point; or rather, the invocation of the B&B is another layer of nostalgia. His trophies are no longer his own – you really can't take them with you – and now his stories aren't his own any more either – they're on the verge of vanishing themselves, unless mounted by a writer like Poliquin within her own textual museum. I guess that might even be spookier than a caseful of passenger pigeons. I doubt I'll actually do it. For one thing, Whispy is not a small cat. He takes up enough room alive, and if I have to keep moving him around the room instead of merely shooing him, he may become annoying. For another, as good as freeze-drying has gotten (apparently), even a 21st-century state-of-the-art zapped cat is not impervious to the elements and the passage of time. Whisper would get dusty and scruffy and threadbare before too long. In fact he'd start that way. I have no intention of euthanizing a plump healthy Whisper just to freeze-dry him, so I'd be delivering a scrawny corpse to the freezers, its fur the worse for wear, and expecting an eternally youthful kitty in return. Somehow I think he's going to buried in the yard alongside all his housepet friends.